Blackberries first graced my market’s shelves several weeks ago, but they reached their full flavor just this past week. While nothing beats eating them right out of the carton, this gastrique comes close. A gastrique is a sweet and sour sauce made from adding vinegar to carmelized sugar, which we did for the carrot sauce in the Sturgeon Saluna. While the technique for this sauce is similar, the blackberries, herbs, and cognac give it a bigger, bolder taste perfect for duck. As it so happens, the Eshkol (and my family) love duck. Many people only prepare duck breast, which we could have done, but my son is a swimmer who eats plenty of protein. Since duck breast tends to be expensive, buying enough for him would have been spendy. Duck legs cost less, and though they take longer to cook, are just as yummy. People often braise duck legs because they can get tough otherwise, but so long as you don’t overcook them, no worries. However, if you prefer to use only duck breast for this, go for it. For that matter, you can also go with just legs. Duck have more fat than other birds because they need the insulation from cold water. This makes it necessary to render out the fat first, so unlike other meats, you need to score the skin and place the duck, skin side down, in a cold, dry pan and then heat the pan gently. Once all the fat has rendered out, strain it through cheese cloth into a clean container, place it in the fridge or freezer, and use it instead of butter or oil for cooking. Why? Because it’s absolutely delicious. When Alan was cooking professionally, he and the other cooks would dip bread into duck fat and eat it for breakfast with a shot of espresso. Shear heaven. 1. With a sharp knife, cut a crosshatch pattern into the skin of the duck legs (being careful not to cut the meat) and season with salt and pepper. Place the duck legs into a heavy cold, dry pan (cast iron works well). Turn on the heat to medium and render out the fat. Cook several minutes until the skin is golden brown. 2. Remove the legs from the pan, pour off the fat, and return the legs to the pan, skin side up. Place the pan into the oven and bake the legs for 30 minutes. 3. While the legs are cooking, start the sauce by combining the water, sugar, and minced rosemary in a small pot. Cook over a high heat until the water boils off and the sugar starts to caramelize (it just begins to turn brown). 4. When the sugar is golden brown, turn off the heat and add the vinegar. (Be Careful! When the cold vinegar hits the boiling sugar, it will splatter and the sugar will “seize” into a solid). Turn the heat back up to high and whisk until the sugar has melted into the vinegar. 5. Add the cognac, blackberries, and chicken stock and cook on high for a few minutes. Once the blackberries have softened, crush them into the sauce (or blend with an immersion blender) and continue to cook until reduced by ¾ or even a little more. 6. While the sauce is reducing, start the Duck breasts. Cut a crosshatch pattern into the skin of the duck breasts and season with salt and pepper. Place the breasts into a cold, dry pan. Turn on the heat to medium, render out the fat, and cook until the skin is golden brown, about 8-10 minutes. 7. Remove the breasts from the pan, pour off the fat, and return the breasts to the pan, skin side up. Place the pan into the oven and bake the breasts for 8-10 minutes. 8. Pass the sauce through a fine strainer into a smaller sauce pan pressing to get all the liquid through, and return to the heat. Stir a little butter into the sauce (about 1Tb) and whisk together. Adjust seasoning and keep warm. 9. Add a handful of blackberries to the sauce just before serving. 10. Slice a duck breast and plate with a whole duck leg. 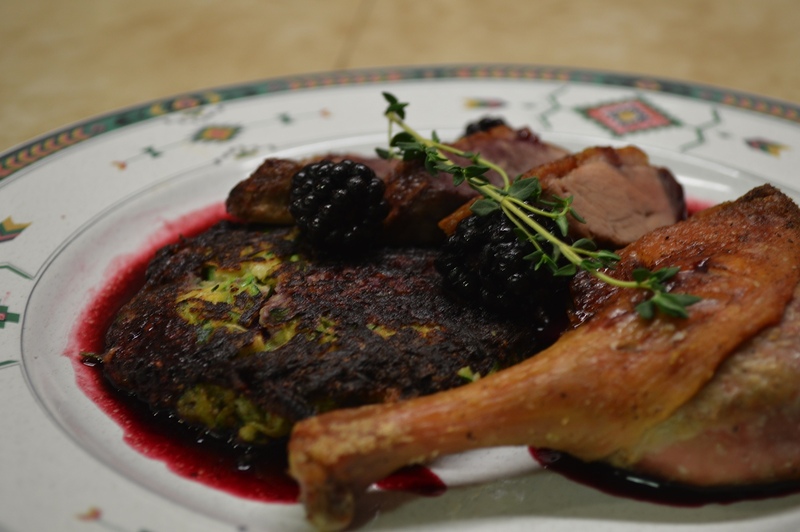 Spoon some of the sauce over the duck along with a few berries, garnish with a sprig of thyme or rosemary, and serve. * We used Pekin duck breast and legs. This recipe would work just as well with Magret duck breast.